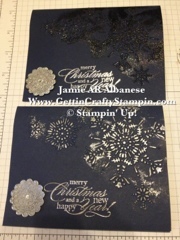 Nabbing my Big Shot, Northern Flurry Folder, heat gun and embossing powers (I prefer the All Silver card). 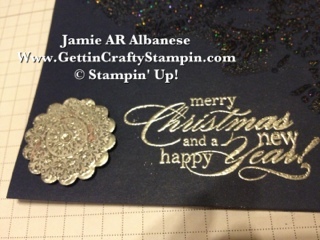 With Night of Navy cardstock, Versa Mark stamp pad and the Delightful Dozen stamp set, this card came out soooo "cool". 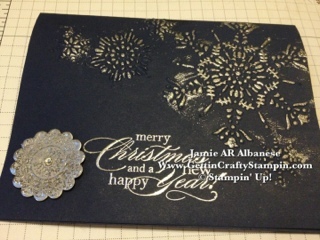 I started by running the cardstock in the Northern Flurries Folder and dry embossed the snow flakes. 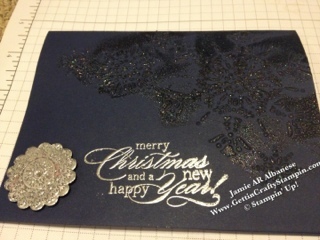 Then I powdered the page reallllly well with the Embossing Buddy. 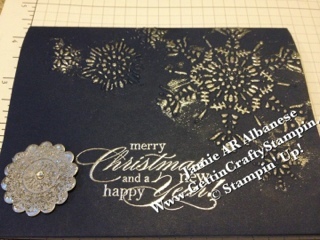 With the Versa Mark pad I stamped the Merry Christmas and a Happy New Year from the Delightful Dozen stamp set. 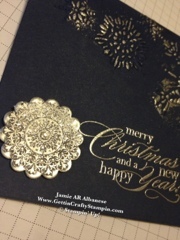 Then carefully drag the Versa Mark pad across the raised snow flakes from the dry embossing folder. 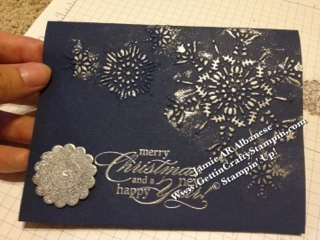 Cover with the Silver embossing powder (I did the silver and the Iridescent Ice across the snowflakes, originally. I did NOT like this look and redid the rest in the Silver and preferred that look!) The sentiment and the snow flakes POP on the Night of Navy paper. 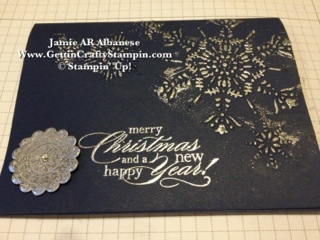 Taking a Whisper White cardstock and I punched out the 1 1/4" Scallop Circle Punch. Then cover it liberally (I pushed it into the Versa Mark pad) then apply the Silver powder. I did this one more time. 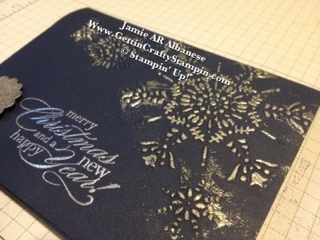 While the heat gun was keeping the silvered scallop warm, stamped my Snowflake from the Mixed Melody stamp set into the Versa Mark pad then (quickly) into the silver scallop while still hot! I had to do it twice to achieve the look I liked. Soooo if you stamp into the Silver and don't like the results, reheat and then (quickly) and Firmly re stamp into the heated scallop. Remember that it'd be challenging to get it perfectly lined up as it has to be quick and hard to achieve a good impression. Too, snowflakes do NOT have to be perfect, so revel in the imperfection. I added an adhesive backed Rhinestone to the center of the impressed upon embossed scallop to add a dash of more shine and sparkle. Love it!! I love this look, this elegant card has tons of open space and yet looks great! Minimal embellishment with HUGE impact! What do you think? Does it Shine for you?? Don't you agree with it all being Silver?? I doooo! Have a bright and shiney Holiday Season! !